While some people may only want to update one or two parts of their smile, many more have a longer list: fixing a chipped tooth, getting rid of excess gum tissue, or lightening their teeth. Our team of doctors can design a smile makeover at their Brooklyn Heights, NY, practice that combines multiple cosmetic procedures into a single treatment plan. Tailored to your unique cosmetic goals, budget, and health, this plan can address numerous cosmetic flaws with the latest technology available. Like a full mouth reconstruction, a smile makeover can ensure that multiple problems are addressed in the most effective way. However, where a reconstruction repairs your smile, a makeover makes it look as good as possible. Consequently, you must receive treatment for any underlying health issues such as tooth decay or periodontal disease before a smile makeover. Porcelain veneers: These thin porcelain shells are attached to the front of your teeth to conceal blemishes and mask minor misalignment. Dental bonding: A more affordable alternative to veneers, this composite resin is applied and shaped to the teeth. Porcelain crowns: Made from natural-looking materials, these restorations conceal tooth damage and protect against future decay. Teeth whitening: We provide both in-office and take-home whitening, as well as membership in our free Whitening for Life program for returning patients. 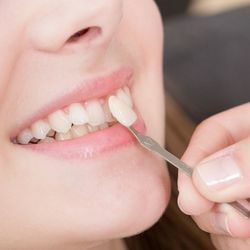 Orthodontics: If you have a misaligned bite, you can choose between traditional braces and Invisalign®, depending on the extent of the misalignment. Gum contouring: The doctors can remove excess gum tissue to create a more balanced frame for your smile. During your initial consultation, our doctors will examine your smile and recommend which procedures are most appropriate. While smile makeovers are primarily cosmetic, they can support oral health, as well. Dental crowns can prevent future damage to teeth while orthodontia can minimize the risk of erosion, structural damage, and temporomandibular joint (TMJ) disorder. Smile makeovers allow you to address a wide range of cosmetic concerns in a way that the results of each procedure complement one another. In addition to restorative effects, a smile makeover can also boost confidence. Patients who are not self-conscious about their teeth are often more willing to speak or smile. This small change can lead to bigger, more positive changes in both your professional and personal life. CEREC: This system allows us to create your crowns or veneers on the same day as your initial appointment. 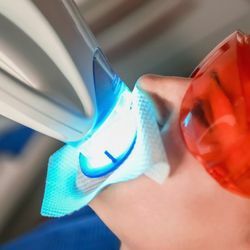 Soft tissue laser: With this gentle device, our doctors can precisely remove gum tissue with negligible bleeding and swelling. Patient amenities: To ensure comfort during appointments, we provide Netflix, Pandora®, and noise-cancelling headphones for all of our patients. These tools help to make your visits as hassle-free as possible. Smile makeovers allow you to address a wide range of cosmetic concerns in a way that the results of each procedure complement one another. Contact Dentistry at the Heights online today or call (347) 492-1018 to schedule a consultation.